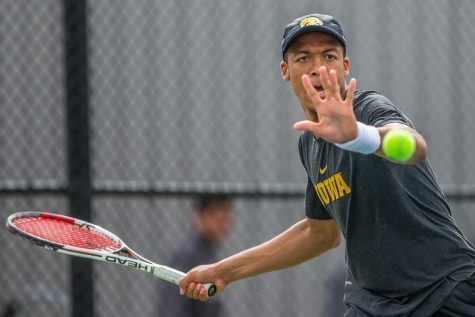 Both Hawkeyes tennis teams sought to gain momentum with the Big Ten Tournament coming up in two weeks, but they failed to do so. 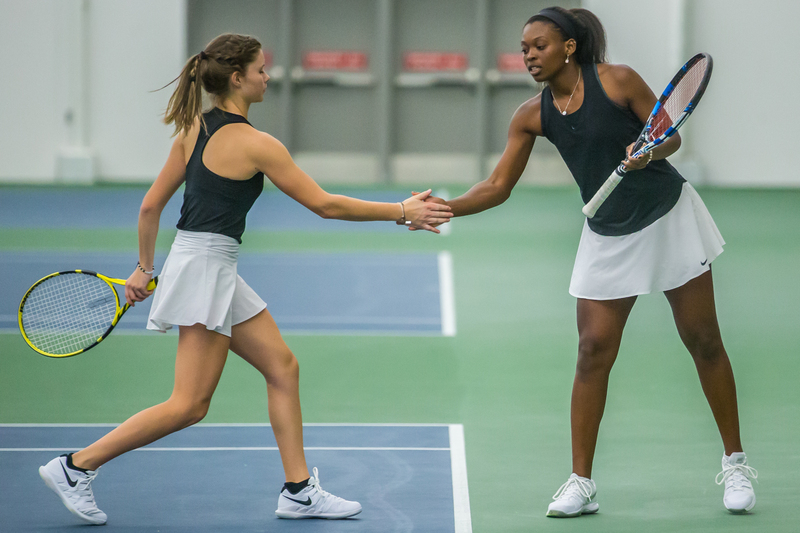 Iowa's Cloe Ruette (left) high-fives Adorabol Huckleby during a women's tennis match between Iowa and Nebraska at the HTRC on Saturday, April 13, 2019. 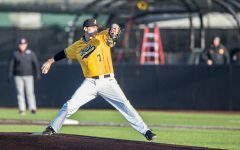 The Hawkeyes, celebrating senior day, fell to the Cornhuskers, 4-2. 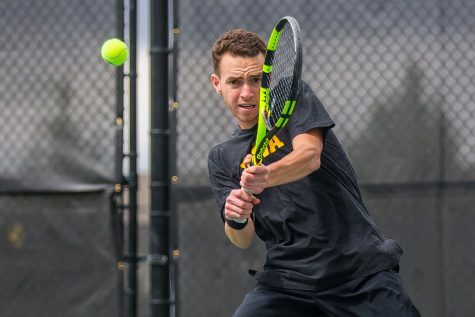 With just three dual matches (Hawkeye men) or two (Hawkeye women) left in the spring season, both of Iowa’s tennis teams failed to pick up momentum this past weekend. 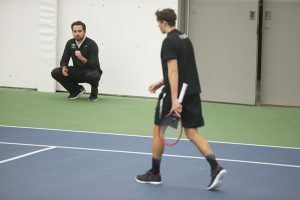 The women’s squad came in riding a four-match winning streak with high hopes as it planned to honor its only senior, Adorabol Huckleby, for Senior Day against Nebraska at the Tennis Complex. Huckleby was celebrated all weekend for her accomplishments both on and off the tennis court. The team had a banquet dinner the night before the match and honored her in front of her friends and family with a pregame ceremony. Huckleby then got her a start in doubles for the first time since March 12 against Notre Dame. 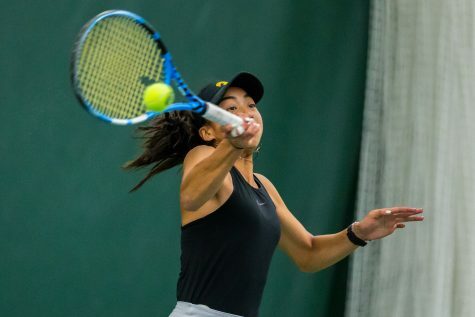 She came in on a three-match losing streak before possibly capping her Iowa career in a 6-4 victory with partner Cloe Ruette. Unfortunately, that was about the only thing that went well for the Hawkeyes. 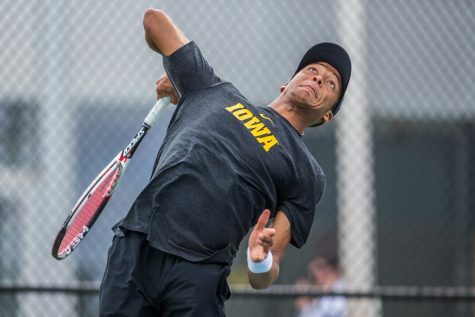 Iowa dropped the doubles point in falling to the Cornhuskers (4-2). only Bacalla and Ashleigh Jacobs pulled through with straight-set victories. 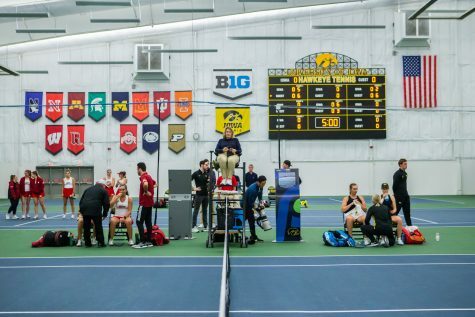 Iowa will get back at it next weekend in its final weekend of Big Ten matches, playing at Wisconsin and Minnesota. Things didn’t work out as planned for the men’s team, either. Iowa headed in hoping to get back in the victory column after fighting a tough battle against No. 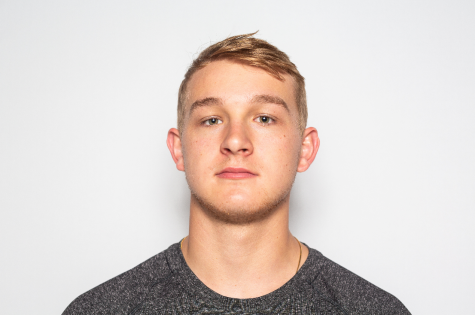 1 Ohio State on April 7. The Hawkeyes fought hard against Purdue, but in the end, they came up short. 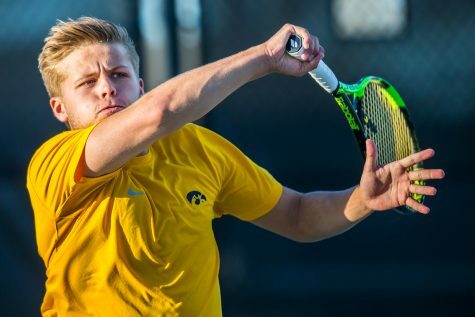 Iowa forced four of six singles matches into three sets but was eventually were edged (4-3). Freshman Oliver Okonkwo cracked the all-time top-10 list for most wins in a single season with 22 after his straight-set victory at No. 2. 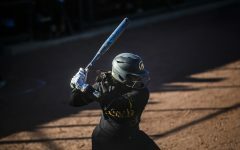 Knowing they needed a win against the Boilermakers to make its case for the NCAA Tournament in May, the Hawkeyes had to do everything in their power to bounce back against Indiana. But they didn’t. Iowa lost (4-0) to the Hoosiers, putting itself at 13-9 on the season. For perspective, Iowa has seen something of a drop-off after starting off 8-1 to begin the season. The Hawkeyes are now 4-5 in the conference after beginning Big Ten play with a 3-0 record. 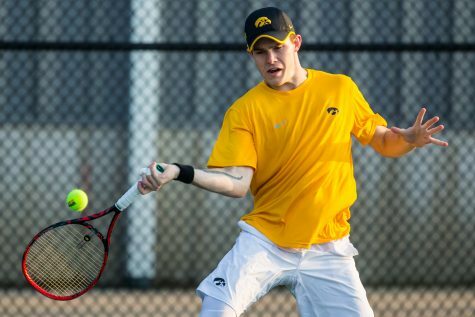 Nonetheless, Iowa bounced back in its third and final match of the weekend. The Hawkeyes bested Indiana/Purdue-Indianapolis to improve their record to 14-9 with three dual matches left. 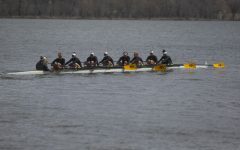 Iowa will resume Big Ten action next weekend against Michigan State and Michigan before closing the spring against Illinois State. All the matches will be at the Tennis Complex.